On Thursday, June 15, MD Now opened its 27th South Florida urgent care center, serving patients in Miami Lakes and surrounding neighborhoods. This grand opening marks the seventh Miami-Dade County location for the area’s leading and fastest-growing urgent care provider. The MD Now urgent care center in Miami Lakes is conveniently located at 16735 NW 67th Ave., Suite #102 Hialeah, FL 33015, on the East side of NW 67th Street (Ludlum Road) in the Ludlum Plaza just North of the Palmetto Expressway. The state-of-the-art center serves residents and visitors to the Miami Lakes, Hialeah, Hialeah Gardens, Opa-locka, Miami Gardens, Miramar, Palm Springs North and Country communities with fast, convenient access to advanced medical services at costs typically much lower than most ERs or hospital-affiliated urgent care centers. Convenient hours and quick, efficient, affordable treatment have become synonymous with MD Now Urgent Care. Adults and children are treated for acute injuries and illnesses with the utmost care. Unlike other medical providers, no appointment is necessary and there are no long waits commonly found in most ER settings—especially with additional MD Now centers opening in South Florida throughout 2017. MD Now patients are provided comprehensive services and immediate care for colds, allergic reactions, cuts, burns, broken bones, dislocations, sprains, strains, and many other medical concerns. All treatment is provided on site for patient convenience. 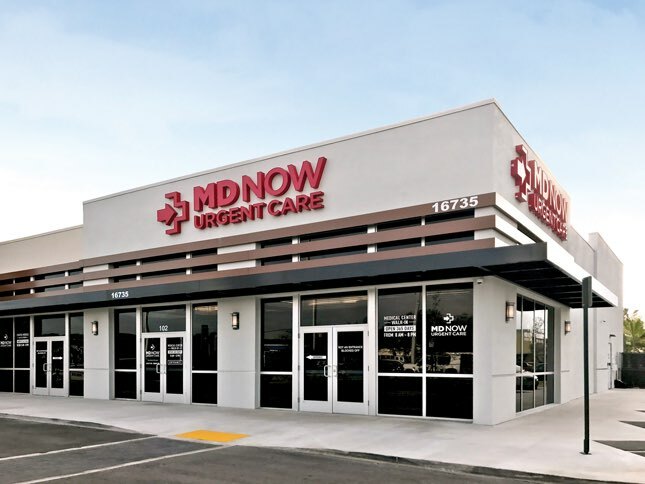 MD Now® Urgent Care Walk-In Medical Centers is the leading provider of fast and affordable urgent care to adults and children in Palm Beach, Broward, and Miami-Dade Counties. Our state-of-the-art, walk-in medical centers are open seven days a week from 8 a.m. to 8 p.m. to deliver an affordable and convenient alternative to long emergency room wait times and the limited hours of family physicians. No appointment is necessary and major insurance plans are accepted. In addition to providing a comprehensive range of urgent care services to treat a variety of illnesses and injuries, our multiple locations offer digital x-rays, EKG, ultrasounds, lab testing, physicals, immunizations, vaccines, physical therapy, occupational medicine, travel medicine and selected primary care services. Find the medical care you need with the convenience you want at MD Now. Call: 888-MDNow-911.